Scoliosis affects 2 to 3% of the adolescent population. For many people it is just a mild form, but others it is disfiguring and whether mild or severe can cause many health conditions and can even be disabling. I have had many patients with scoliosis suffering with breathing restrictions, headaches and migraines, neck pain, back pain, sciatica, degenerative spinal conditions, numbness and tingling down the arms and many other symptoms resulting from the curve in their spine. If you or somebody you know suffers with scoliosis, share this interview and information with others so they can have their scoliosis corrected early with natural, non-invasive chiropractic care. I offer a complimentary scoliosis consultation at our Freehold, NJ office: Hometown Family Wellness Center. We have been helping scoliosis patients in Freehold and the surrounding towns of Marlboro, Manalapan, Howell, Jackson, Colts Neck, Morganville and other communities in Monmouth and Ocean Counties in New Jersey. Being a chiropractor in Freehold, NJ, I see patients from most of Monmouth County and other parts of the state that suffer with sciatica. After treatments with medications, rest, and physical therapy the problem persists because these treatments do not get to the cause of the sciatica the majority of the time. Medication at best will just cover up the pain of sciatica, but it will not correct it. Taking medication is like if you went to the dentist for a toothache or painful cavity and the doctor said for you to take some pain medication and anti-inflammatories but not treat the cavity. You know that the cavity would continue to decay and get worse, eventually needing drastic procedures to fix what could’ve been prevented in the first place. Yet, this is the way most doctors treat patients and you follow their lead. Physical therapy has a slightly higher success in treating the sciatica as many times the PT will first do some therapies like electric stimulation or ultrasound to ease the pain and decrease the swelling, then do some stretching to loosen the muscles and probably finish with some strengthening exercises to try to stabilize the area. Short term this gives relief bu this in long term can cause problems as the underlying cause is still not being corrected and doing these exercises will just splint the area in the imbalanced position. The problem will further degenerate years down the road. Chiropractors look for the cause of the problem. Many look for misalignments called subluxations, where the vertebra move out of place, putting pressure on the nerve, therefor causing the symptoms of pain, numbness and tingling, and leg weakness. These bones moving out of place can cause a herniated disc, swelling and degeneration in the long run. By performing chiropractic adjustments, chiropractors reposition the bones of the spine to remove the pressure on the nerve, thereby getting to the cause of the problem. In our office at Hometown Family Wellness Center, we take a multi-pronged approach to not only find the cause, but many times the surrounding muscles of the spine and legs are out of balance and will pull the bones back out of place. While adjusting the spine, we also perform therapeutic activities to those supporting soft tissues: hamstrings, quadriceps and piriformis muscles in the legs, as well as the paravertebral muscles of the spine. This overall approach, gets the optimal results, as our goal is to get you out of pain and enjoying your normal activities. Would you like your health professional to find the cause of your back pain and sciatica so you can enjoy your normal daily activities and time with friends and family? Would you like to finally live without the pain and prevent future problems? If you answer yes to these questions, live in Freehold or the surrounding towns of Marlboro, Manalapan, Englishtown, Morganville, Colts Neck, Howell, Millstone or Jackson, NJ, contact Hometown Family Wellness Center to get on the road to recovery as soon as possible. 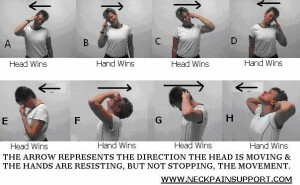 Suffering with Neck Pain? Freehold Chiropractor Suggests Exercise and Stretching! My name is Dr. Russell Brokstein and as a chiropractor in Freehold, NJ, I see many patients with neck pain on a daily basis. Many chiropractors just adjust their patients, but don’t show them exercises to help expedite recuperation. In my office, exercise and stretching therapy is incorporated into all treatment plans. Home exercise is so important and should be done by everybody. If you have any pets, just watch them when they wake up from sleep or a nap and you will see the first thing they do is stretch to make sure all the muscles, tendons and ligaments are loose. Exercise for the neck is very important since weak muscles are related to many painful conditions of the neck and, can contribute to fatigue, irritability, headaches and migraines, sleep loss, stress, numbness and tingling, shoulder pain and so much more. When done correctly (perform slowly, staying within “reasonable” pain boundaries), you can increase your range of motion, reduce stiffness and tightness, and strengthen your neck muscles. Just remember, before starting any exercise program to consult your doctor. Also, if you have pain during exercise to get checked by your doctor and report what you are experiencing. 1. Push your head into your hand while moving the head to the end of the range, “…letting the head win” (See A, C, E, G). 2. Repeat this going back in the opposite direction by “letting the hand win” (see B, D, F, H), again, moving through the entire range of motion. 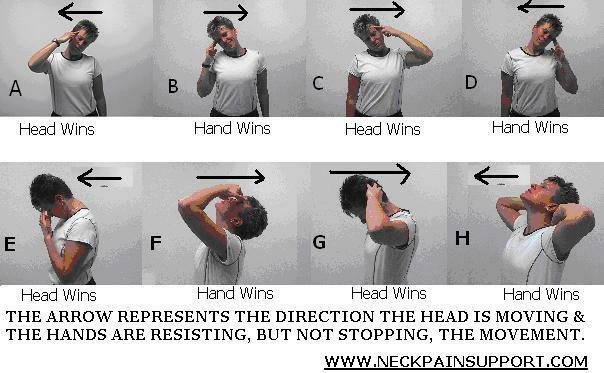 ALWAYS push the head into the hands, Make sure you move the head against resistance in BOTH directions, 3 times each (A-B then B-A 3 times; C-D then D-C 3 times) then, (E-F then F-E 3 times, and lastly, G-H then H-G, 3 times). The trick is doing this VERY slowly (to build motor control and coordination) and to move through the entire “comfortable” range of motion. Repeat 3 times slowly. If pain worsens, lighten up on the amount of pressure used or, stop the movement just prior to the sharp pain onset. If you can’t make it to the end of the movement due to pain, make a note of how many reps it took before the onset or increase of pain and how far you could move your head. Do 3 slow reps and then move to the next exercise direction. These exercises can be performed 1 to 3 time a day, according to tolerance, and will increase your range of motion, increase strength, and build coordination, all at the same time. Feel free to contact our office for additional exercises or to answer any questions concerning you, your loved ones, or friends. If you are experiencing any neck pain, you are a candidate for chiropractic care. Pain is a sign to you that something is wrong and shouldn’t be taken lightly. The longer you wait to get a problem checked the more chronic it can become and more difficult to correct. Chiropractors are the only health professionals properly trained to detect and correct the cause of musculoskeletal problems. By find the cause of the problem, we can correct the cause, so you can once again enjoy your normal daily activities and be out of pain. If you are in Freehold, or the surrounding towns of Marlboro, Howell, Jackson, Morganville, Colts Neck, or Manalapan and other nearby towns in Monmouth County, New Jersey, call our office, Hometown Family Wellness Center, for a consultation and find out why chiropractic has the highest success in patient satisfaction! Freehold Chiropractor asks "Do You Smell Something Burning?" As a chiropractor in Freehold, NJ a feel it’s so important to educate the local communities of Freehold, Marlboro, Manalapan, Howell, Jackson, and Colts Neck NJ the importance of health and wellness. Part of this is warning signals the body is sending each of you. The worst of all of this is that the patient actually thought his doctors advice was good and in many instances, the public follows what the medical doctor tells them as factual. So, just as I asked this patient, I ask you: “if your smoke detector went off in your home, the 1st time it would probably catch your attention. If it went off a 2nd time it would most likely take hold of you. But if it went off a 3rd time and finally compelled you to do something, would you take the batteries out so you wouldn’t have to hear it anymore? “Of course not,” he replied “that would be stupid…” He got the point! Do you get the point? The moral of the story… Symptoms are your body’s attempt to warn you to help save it. Masking your symptoms (whether it be pain, sciatica, headaches, fibromyalgia, acid reflux, stress, numbness or tingling, nausea, diarrhea or fever) with drugs doesn’t fix the problem, it actually makes the situation worse. Think about this for a second: if you went to the dentist, would you want him to just inject a painful cavity with Novocaine and leave the cavity? You know the cavity might not hurt anymore, but the cavity would continue to get worse and you would want the dentist to fix the tooth. It’s smarter to find the cause and deal with it the right way. That’s why they call Chiropractors DC’s because we are Doctors of finding the Cause! Chiropractors don’t just cover up your pain, we find the cause and correct it. patients. Misalignments of the shoulder can create or irritate neck pain. The shoulder imbalances can also cause other problems including headaches or migraines. as normal patients had insidious onset neck disorders while those patients that had shoulders that were rotated forward slightly had neck problems resulting from whiplash. Like many other studies, it is found that whiplash patients have a higher risk of developing shoulder pain and experiencing a number of other conditions including pain, headaches, numbness and tingling just to name a few. This shows that neck injuries alter the function of other areas of the body and that it’s so important that a patient finds a practitioner that addresses the entire spine and other surrounding regions, not just the location of the pain itself. Miller J, Gross A, D’Sylva J, Burnie SJ, Goldsmith CH, Graham N, Haines T, Bronfort G, Hoving JL. Manual therapy and exercise for neck pain: A systematic review. Manual Therapy 15(2010) 334-354.